Sometimes new parents will half jokingly complain that their precious new charge did not “come with an instruction manual”. They may be overlooking something. They don’t even have an instruction manual for their own selves. Think about it. Even the simplest utensil or small appliance nowadays comes with pages of instructions, often in multiple languages. First there are the expansive and imaginative safety alerts, which notify us that hot things burn, sharp things cut, moving things move, electrical things may shock you and that you should not use your curling iron on your eyelashes, give your toddler a bath in the washing machine, or try to iron your clothes while you’re wearing them. Helpful diagrams label every component, wire, and button and there are step-by-step detailed instructions for use and care. But where’s the manual for a human being? How do we operate ourselves safely? What are the names of our parts and how are they supposed to work together? For our bodies, of course, we have anatomy textbooks with diagrams of the body systems, cutaway views of the various organs, and even microscopic photographs of tissues and cells. But I’m not talking about the body; I’m talking about everything about the human person that cannot be reduced to the body, to merely material “stuff”. We all have questions about these things. Is my soul a spirit? Does my soul have parts or powers? Is my soul inside of my body? Can I know God by my reason? And what is my reason anyway? Should I listen to reason or to God? If I think I chose something of my own free will, did I really choose it? Or can God make me choose it? Can Angels and Demons read my mind? Is my mind the same thing as my soul? What is sanity? Is it possible that all human beings are insane in some way? What is the secret to happiness? Is pleasure the same thing as happiness? What is love for? What are passions? Is love stronger than hate? Is possible for man to hate himself? Is it possible for man to desire something bad? How can I form good habits and overcome bad ones? Am I at the mercy of my desires? How important are well ordered emotions to my spiritual life? What is the difference between a natural virtue and a supernatural virtue? What is the difference between a passion and a virtue or a vice? Are we excused from sin by ignorance? What about by strong passions? What are the different kinds of love? What are the different kinds of fear? These are just a tiny few of the questions that are covered in Peter Kreeft’s new book, Practical Theology: Spiritual Direction from St. Thomas Aquinas subtitled 350+ Ways Your Mind Can Help You Become a Saint (Ignatius Press, published late last year). Peter Kreeft had previously written an anthology of St. Thomas’ philosophical wisdom called A Summa of the Summa. 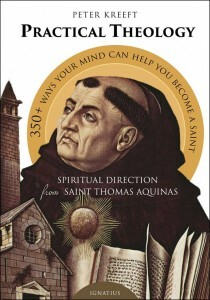 In this newer book he pulls out passages from St. Thomas on holiness, happiness. and spirituality. 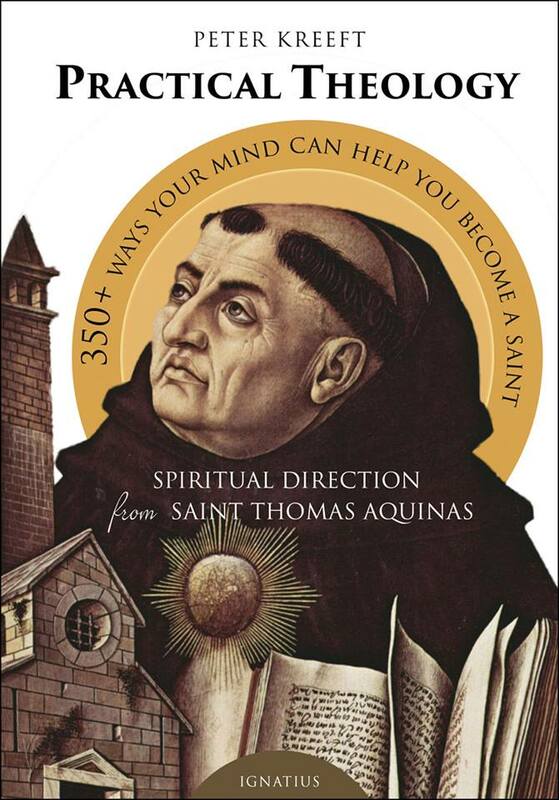 This is spiritual reading of the highest order and a magnificent instance of inspired teaching, both on the part of St. Thomas and on the part of Peter Kreeft for making St. Thomas so accessible to all of us. You could do few things better for your own spiritual life than to read this book — a veritable instruction manual for your very human self — and then read it again, and then read it again.